Preheat oven to 400 degrees. Peel the butternut squash & cut into ¼-1/2 inch chunks. Toss with olive oil, sea salt, pepper & a drizzle of agave. Roast for 25-35 minutes. Chop kale into bite size pieces & steam for 3-5 minutes. Heat lentils according to package directions. For the Maple Vinaigrette: Whisk together olive oil, cider vinegar, maple syrup, & Dijon mustard. Season with sea salt & pepper. 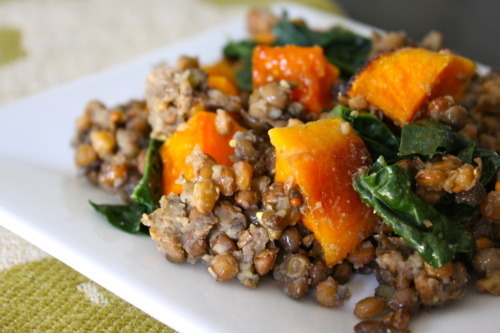 In a large bowl, combine roasted butternut squash, steamed kale & lentils.Toss with dressing & serve warm. The flavor combination was wonderful, as well as my lackluster palate could detect. 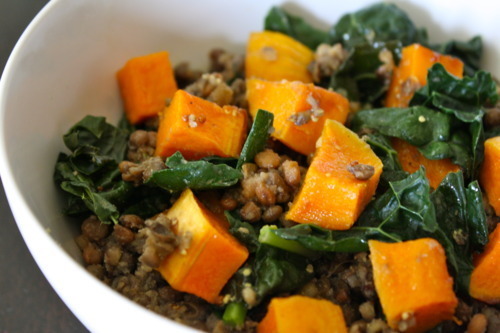 I look forward to making this again when I am feeling better, & when my taste buds & spirits are brighter. Until then, it’s back to bed I go!